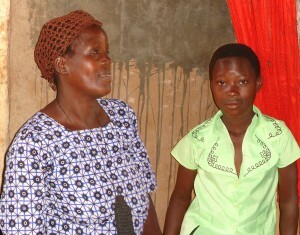 Nabirye Beatrice (left) and her daughter Dorine, a CFTC sponsored child since 2008. The ultimate goal of CFTC’s Sponsor a Child program is to give children the foundations they need to secure a successful, poverty-free future for themselves and their own children. The inter-generational nature of poverty–and of poverty alleviation–means that we must pay close attention to children not in isolation, but as members of a family and a community. That is why CFTC’s child sponsorship approach is community-based. And that is why the opportunity to meet with and get to know children within the context of their home and community environment is such an important – and illuminating! – story to share. Amboka Wameyo, CFTC’s Africa Regional Program Manager, had the opportunity to do just that when she visited Nabirye Beatrice and her daughter, Dorine, on a monitoring visit in January, 2014. Because school was out for the holiday, she met the 47-year-old widow and 11-year-old Dorine in the family’s home in Bugiri District, Uganda. 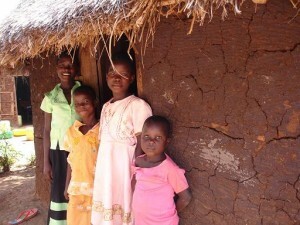 Dorine (left, back) and her school-age siblings standing outside their sleeping hut. Married young (at age 19) and widowed early, Nabirye now supports a family of six children with what she earns from farming and the baked goods she sells at the local market. She was busy preparing bhajia – a soy-flour fritter that she sells along with home-made pancakes each day at a local market. She also grows sukuma wiki (kale) and biringanya (eggplant) in a small kitchen garden near her house. In the last few years, Nabirye has received training from CFTC’s local partner UCOBAC and also participates in a community savings group, which has helped her establish these home-based businesses. 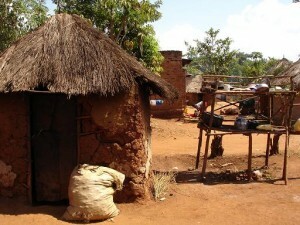 The family’s home is made up of three structures: a round mud hut with thatch roofing which serves as kitchen; a temporary mud hut where the older children sleep (“The four older children sleep there so they have a quiet environment to read,” said Nabirye); and a semi-permanent, two-room main house where Nabirye sleeps with her youngest children. The main house is covered with corrugated iron sheets and the bedroom floor is finished (plaster) but the living room floor is yet to be done. Kitchen hut, from which Nabirye bakes products for sale at market. Getting water for drinking and household tasks is also challenging. “I get water from the protected well which is far – about one mile from here. We had a borehole but it broke down,” she explains. “I get the water myself because the path to the water point is hilly. I go with the elder girls but I go up the hill and bring the water down to the girls to bring home.” The family’s sanitation facilities (a pit latrine) are also less than ideal. Nabirye mentions that she “went to school a little – until primary Grade 6.” Seeing her daughter do well in school and have the potential to not only gain a primary education but move on to secondary school is clearly a source of pride. It’s also still not a sure thing in Uganda. Although striving to meet the Millennium Development Goal of universal primary education by 2015, Uganda’s primary graduation rate for girls is still just a little over half (54.2%) as of 2011. “My greatest hope is that all my children receive an education. I know education is an investment and I will benefit from that investment,” Nabirye said. 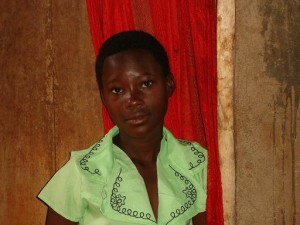 With her own capacity to earn a living established, and with the support of generous sponsors for Dorine, the chance of Dorine’s dream of becoming an accountant look extremely positive.